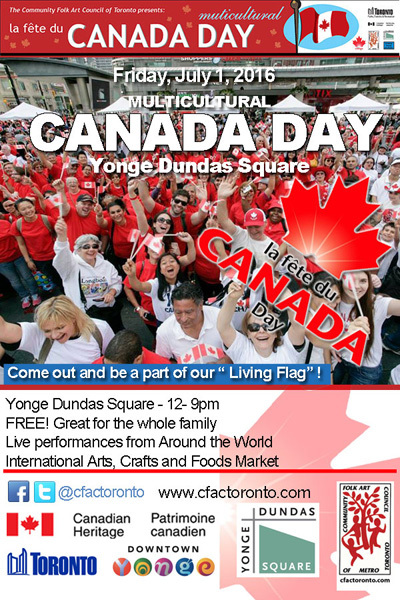 A lot is happening in Toronto this holiday weekend in the free or nearly-free multicultural department. The Fringe Festival started on June 29 and goes on until July 10. Over 1100 different performances by people wanting to put on a show. Maximum ticket price for adults is $12. Which ones should you patronize if your interest is in other cultures? The Star had a good review of Silk Bath, a game show format that chooses which Chinese people are suitable to immigrate to Canada. Another possibility is Dario et la Diablesse: A Caribbean Musical (St. Lucia and Barbados). Folk Lordz: Warriors & Fools brings “together Cree-Blackfoot warrior stories and Yiddish fools’ tales into an innovative improv spectacle!”. Shows and venues are listed on: http://fringetoronto.com/fringe-festival/shows/. Mel Lastman Square: Lisa Odjig champion First Nations hoop dancer, Emmanuel Jal (Somalia-born hip hop artist). Fireworks. http://bit.ly/1hVfVWX. Pride Month started June 1. Its Trans March is today, July 1 at 7pm, its Dyke March at 2pm July 2, and it huge annual parade is this Sunday July 3 at 2pm. A list of Pride Parade participants is on http://www.pridetoronto.com/pride-month/pride-parade/ . It includes First Nations, Russian speakers, Ismailis, Jews, Latinos, and Metis. Queen’s Park: July 1, Midway rides, inflatables, and performances. From 10 am to 5pm, with the official opening and 21-gun salute beginning at noon. http://bit.ly/V4T2vB. 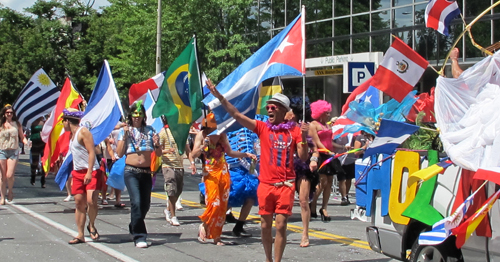 Yonge-Dundas Square: Images of the Pride Parade were taken in 2013. There’s probably a lot more events happening in other parts of the GTA too. Happy Canada Day!! Free Entry! Free Parking ! Free Family Event! For more information contact Sukhdeep Sandhu 905-867-2300.